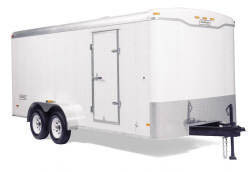 Elixir Door and Metals Company steel and metal fabrication capabilities are well suited to meet the needs of cargo trailer manufacturers. With a wide range of steel and metal fabricating capabiliites ranging from laser cutting systems, CNC breaks and presses along with more traditional steel and metal fabricating equipment, we are able to fabricate a variety of cargo trainer components used by manufacturers. WIth our laser cutting systems we can fabricate cargo trailer components with customized fabrication and intricate designs such as logos and more. Our steel fabrication services can provide low-tolerance solutions manufacturers require in today's demanding market. Contact any of the division locations at the bottom of the page for information on how we can serve your cargo trailer component requirements. Below is a sampling of some of the typical metal fabrication we produce for cargo trailer components.